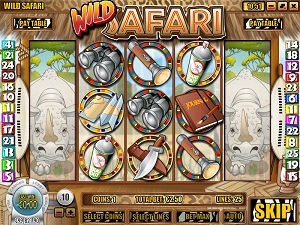 Wild Safari is one of Rival’s most popular i-Slots and as soon as you start spinning the reels, you’ll understand why. Imagine that you are on a safari in the great Serengeti of Kenya and Tanzania where you get to see all the wild life. Wild Safari lets you follow the explorer in his adventures by the very amusing interactive bonus rounds. There’s a high level of interaction in this slot. Combine the bonus rounds with the very fun expanding wild features where you get attacked by the local wild life and have to escape. Wild Safari is one of the reasons why Rival’s i-Slots became so popular – you are involved in the story and can influence the outcome. This is a great slot machine with 5 reels and 25 pay lines which puts you in the middle of a great African adventure. Wild Safari will make you tremble with excitement when you hide from the attacking lions and rhinos! In order to create such an exciting slot machine where you interact in the bonus round, you will have to have a high level of graphics to make it work. All symbols in this game are themed related and the design is very detailed. The sound is great too. During the main game you will hear the sound of native music scores. For some reason they have chosen the sound of the Australian didgeridoo which is odd considering that this slot adventure is set in Africa but it does enhances the wildness of the theme. All the symbols in Wild Safari are themed related. This means that you will not see any card deck symbols or other types of standard casino symbols. Each game level has its own set of symbols. The main game has the explorer symbols like knifes, journals, bug spray and flash lights. The wild is the safari Jeep and this is an expanding wild and will expand over the first or the fifth reel when you hit it. The wild symbol substitutes for all other symbols except for the scatter. The free spin scatter is the air plane and it will trigger the free spin feature if you hit three or more on the reels. It will award you with 10, 20 or 75 free spins depending on if you hit 3, 4 or 5 scatters on the reels. The bonus symbol is the camera. If you hit three or more of this one, you will activate the bonus round. The free spin feature is triggered if you hit three or more air plane scatters. You will be awarded with 10, 20 or 75 free spin depending if you hit 3, 4 or 5 scatters on the reels. All wins pay X3 during free spins. The bonus round is activated once you have hit three or more bonus symbols, which is the camera symbol. This will take you on an exciting safari adventure where you interact in the story. You will choose what type of safari animals you wish to photograph and by doing so you will have the chance to win some extra coins. Once this is done, you will be taken back to the main game where all symbols has changed to animal symbols. Wild Safari has 5 reels and 25 pay lines. You may bet as little as 0.01 coins per line. The maximum bet per line is 0.25 coins. Wild Safari has an Autoplay function which is very comfortable to use. « More slotmachines guides Article last updated: Wednesday, March 07, 2012.